A former model aged 23, and the wife of Mr Patrick Joyce, latter jailed for 14 years for his part in an aggravated burglary at the Corcoran home in Burnchurch, Killenaule, Co Tipperary, was told by a judge that she was part of a contrived accident that led to claims by herself and three of her sisters-in-law, for damages totalling €240,000. Mrs Julieanne Joyce (23) and her sister-in-laws were ordered last June to pay legal costs, which are expected to total almost €100,000, following the throwing out of all claims by Mr Justice Terence O’Sullivan in the Circuit Civil Court. Mr Patrick Joyce, from Beaumont Hall, Beaumont Woods, Dublin 9, was among a total of 7 such individuals, including Mr Dean Byrne, aged 22, with an address at Cabra Park, Dublin 17; Mr Patrick Gately, aged 28, with an address at Primrose Grove, Darndale, Dublin 17; Mr John Joyce, aged 19, from Lentisk Lawn, Donaghmede, Dublin; Michael McDonagh, aged 22, from Tara Lawns, Belcamp Lane, Coolock, Dublin 5; Thomas Flynn, aged 19, Moatview Avenue, Coolock, Dublin 5, and Donal O’Hara, aged 21, from Glin Park, Coolock, Dublin 5; who all pleaded guilty to their crime. The gang had been found guilty on October 1st, 2015, of breaking into the Corcoran home, armed with a sawn-off shotgun, a handgun and a machete, (Latter a broad bladed implement used in combat, like a short sword). Mr Mark Corcoran had suffered a fractured eye socket and a broken nose, from a blow from one of the raiders guns. This had resulted in him later undergoing four separate surgeries in an effort to reconstruct his face. Children, who were present in the house at the time of the robbery, were also threatened with death. 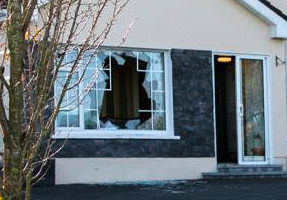 This attack, combined with numerous others robberies on those currently resident in rural Ireland, eventually lead to a meeting of some 2000 unhappy Tipperary people; held in the Anner Hotel, in October 2015. The purpose of this meeting; to rebuke the then FineGael /Labour Government over the lack of Garda resources in Co. Tipperary. The meeting in turn led to the setting up by An Garda Síochána of ‘Operation Thor’, sanctioned by government in November 2015. Two of the afore mentioned criminal gang, namely Mr Patrick Gately, who had 85 previous convictions, and Mr Dean Byrne who had 120 previous convictions, both had their original sentences reduced from 16 years imprisonment to 14 years. Judge O’Sullivan informed Ms Joyce that her case taken against the Motor Insurers’ Bureau of Ireland (MIBI) and a taxi driver, had all the hallmarks of an exaggerated claim to maximise injuries. The Judge noted and accepted that the four women in question had remained within the vehicle moaning, following this contrived collision, resulting in firemen removing the vehicles roof because of alleged spinal injuries. The 23 year old Mrs Julieanne Joyce, with an address at Edenmore Walk Apartments, Raheny, Dublin; together with her sisters-in-law Kathleen O’Reilly aged 30, from Clongriffen, Dublin; Elizabeth Ward aged 28, from Priorswood, Coolock, Dublin, and Philomena Joyce aged 19, of Moatview Avenue, Dublin, had all sued the defendants for €60,000, arising from this contrived rear-ending on May 5th, 2014, on Clonshaugh Road, Dublin.